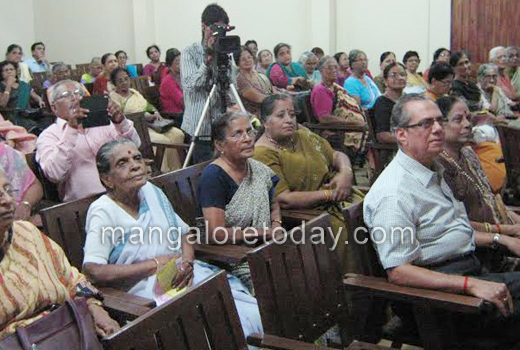 Mangaluru, July 29, 2015: AGE (Action Group for Elderly) Mangalore, held a presentation by Jerardin D’Souza director of MAA - Mangalore Alzheimers Association on ’Dementia’ for all interested citizens at Sahodaya hall Balmatta on July 28, 2015. The programme was conducted by AGE office bearers Shameem Kunil, president, Zahid Hussein Baji, secretary and M. Raghavan, treasurer. In view of the death of Bharatratna A P J Abdul Kalam, former President of India the gathering condoled his death and stood for two minutes in silence in memory of the Late A P J Abdul Kalam. 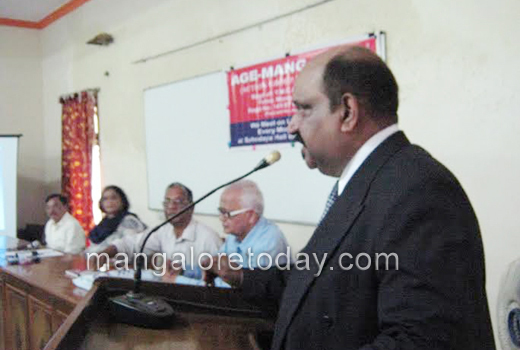 ’MAA - Mangalore Alzheimers Association’, director Jerardin D’Souza, delivered a useful talk with power point presentatation for near one hour. Defining the deference between ’dementia’ and ’forgetfulness’ he gave the examples of Goerge Fernandes, A B Vajpayee, Mohd Ali, Ronald Reagan and so on. 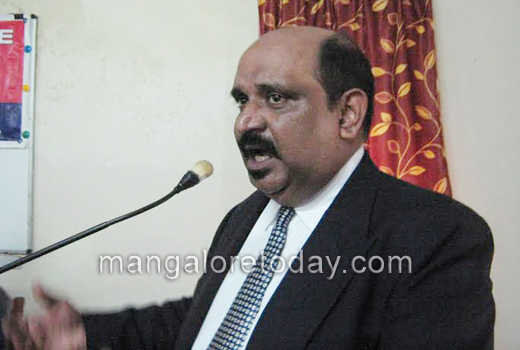 Explaining the possible causes as per medical theories he said that brain degeneration which is irreversible normally is cited as the main cause. As per medical research women are twice more susceptible to dementia compared to men. watching TV for hours together in a sitting position can increase the chances of speeding up on set. Consistent and constant physical excercise and mental activity is the best way to prevent and control dementia. 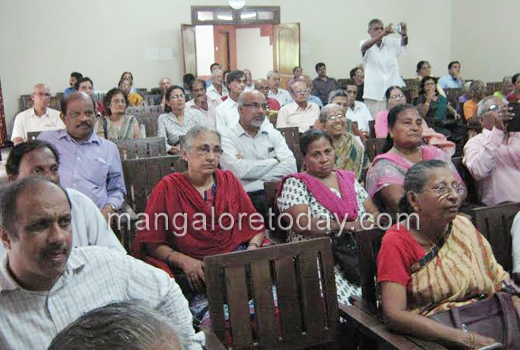 Dementia is of several types and it is difficult even for doctors to be specific on the type and treatment, though no fixed treatment and cure is on the cards. However, from practice many do’s and don’ts are tabulated and can benefit in many ways. It is good that elderly take the help of doctors when needed. The MAA has a motto : "When cure ends....care begins," in the modern scenario caring for Alzheimers sufferers is a frustrating task......it is also very difficult to get trained people to provide care. The economic and social burden apart from the acute stress is very grave on the family and next of kin. Care givers too need tremendous support in the difficult task day in and day out. Brief idea on the illness : Alzheimer’s disease (AD), also known as Alzheimer’s, accounts for 60% to 70% of cases of dementia. It is a chronic neuro degenerative disease that usually starts slowly and gets worse over time. As the disease advances, symptoms can include problems with language, disorientation (including easily getting lost), mood swings, loss of motivation, not managing self care, and behavioural issues. As a person’s condition declines, they often withdraw from family and society. Gradually, bodily functions are lost, ultimately leading to death. Although the speed of progression can vary, the average life expectancy following diagnosis is three to nine years. The cause of Alzheimer’s disease is poorly understood. About 70% of the risk is believed to be genetic with many genes usually involved. Other risk factors include a history of head injuries, depression, or hypertension. The disease process is associated with plaques and tangles in the brain. A probable diagnosis is based on the history of the illness and cognitive testing with medical imaging and blood tests to rule out other possible causes. Initial symptoms are often mistaken for normal ageing.